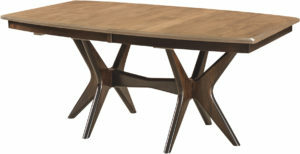 The Montana Trestle Table has a unique trestle base with three legs on each side. 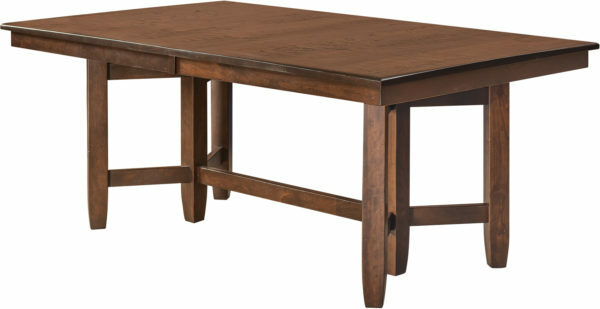 Its hand worn edges and 1-inch square top really add a nice touch to this Amish dining table. There are levelers in the base for added stability and geared equalizer slides which make opening and closing this table a breeze. Thus, making it incredibly easy to access the self store table leaves without skirts. However, if you prefer table leaves with skirts that is an option, but please note those will not be self stored within the table. Finally, check out the Montana Sideboard if you are looking for a sideboard in the same style. For a quote, click on the “Customize This Product” button. 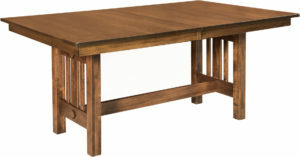 Then, choose from the wide selection of options available for this Montana Trestle Table. Please consider visiting us in Amish Country, in Shipshewana. 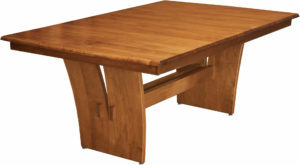 Then, you will be able to see a wide selection of our quality crafted, solid wood tables in person. Additionally, you can call or e-mail us with any questions you may have, for help in customizing this dining table to meet your needs or for a complimentary price quote. We look forward to assisting you in any way we can.